A popular substitute for starch is cauliflower. It can be used to replace potatoes in mash potatoes and even rice! Tonight I tried my hand at the mash. I simply boiled the cauliflower until soft, i.e you can pierce them with a fork. Then I drained them and let them sit for a while. This ensures that any excess water is drained off, otherwise your mash may be a bit watery. Then I added A LOT of butter and mashed it up. At first I used a masher but I couldn't get a smooth consistency so I resorted to a hand blender! 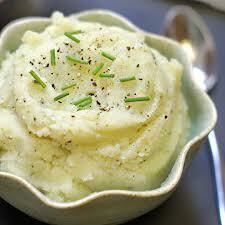 I also added a fair bit of salt and some pepper, as it was more bland than traditional mash. So how did it compare to the real deal? Well to be honest I prefer mash potato to mash cauliflower but it certainly is a decent substitute. Served with a gravy, I had no complaints and will definitely make it again!